Imagine you step into your favorite restaurant. In one corner, you see all eight of your city councilors and the mayor seated around a large table with about a dozen other people, celebrating the retirement of a long-time city employee. Is this a city council meeting? Are they required to post notice, invite the public and keep minutes?This is just one example of a possible open-meetings complaint. 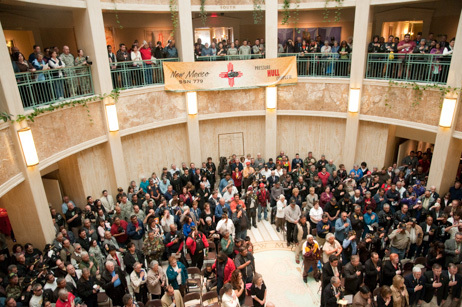 To determine whether the New Mexico Open Meetings Act has been violated, we first have to determine whether the law applies at all. There are two questions to ask, and if the answer to both is “yes,” we can look to the Act’s requirements and see if there has been a violation. (b) makes decisions or sets policies that are binding on the original public body. This might include something as simple as narrowing options by selecting finalists. In short, the Open Meetings Act is in effect whenever a group of people are authorized to vote on government policy — the public has a right to hear those discussions and see those votes. Some groups which are generally not considered subject to the Open Meetings Act are: fact-finding committees, advisory boards (provided they leave all options on the table for the main public body to consider), and the boards of independent non-profit organizations. A quorum is generally half the members plus one, unless otherwise specified in the board’s law or regulation. The quorum doesn’t need to be in the same room to hold a meeting; they might discuss public business in a series of e-mails or phone calls, over several days. This is called a rolling quorum, and it’s illegal unless the participants follow all the requirements of the Open Meetings Act. Our hypothetical retirement-party scenario is tough — a court would likely rule that the city council did not have to invite the public to the party, provided that councilors did not engage in any discussion of city business. Members of a public body are not prohibited from participating in social activities together. However, people are always watching, and elected officials who want to earn and keep the public’s trust are conscientious in avoiding the appearance of secret meetings.